What do atheists mean when they speak of the “Euthyphro Dilemma” as a means to discredit theism? The so-called Euthyphro Dilemma has its genesis in Plato’s dialogue Euthyphro in which Socrates and Euthyphro discuss the nature of piety: “Is the pious loved by the gods because it is pious, or is it pious because it is loved by the gods?” (2008). Over time, philosophers have sharpened the salient point of the dilemma by presenting it in a modified form. The world-renowned late atheist philosopher Antony G.N. Flew worded the argument this way: “Are the things which are good good because God approves of those things, or is it the case that God approves of those things which are good because they are good?” (Warren and Flew, 1977, p. 26). By this thorny contention, the atheist hopes to dismiss the notion of God by placing the theist in an untenable dilemma. On the one hand, if an action is right simply because God approves it, then morality would be the product of the arbitrary will of God, which He could just as easily alter. Instead of saying that lying and murder are wrong, He could just as well have said they are right—and that divine intention would make them so. On the other hand, if God approves of an action because it is inherently good, then an objective standard exists outside of God that He merely acknowledges. Such a law would therefore be above and higher than God. 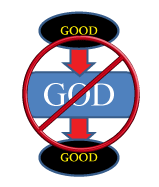 By the Euthyphro Dilemma, atheists think they have demonstrated that good is either above or beneath God and thereby proof that God is not God (see Figure 1). But this dilemma is impotent in that it fails to take into account the nature, being, and character of the perfect God of the Bible who is eternal and infinite in all of His attributes. Goodness, like all God’s other attributes, flows from His very being as the Ultimate Good (see Figure 2). Good is neither above nor below God (cf. Mark 10:18; 1 John 4:8; Psalm 33:5). God’s attributes and God’s will are inseparable. The alternatives posed by the atheist do not pose a proper dilemma. Plato (2008), Euthyphro, trans. Benjamin Jowett, http://www.gutenberg.org/files/1642/1642-h/1642-h.htm. Warren, Thomas and Antony G.N. Flew (1977), The Warren-Flew Debate on the Existence of God (Ramer, TN: National Christian Press), info@nationalchristianpress.net.